» Forum » All Pinball » Redos? Remakes? What old machine would you like to see updated? » Redos? Remakes? What old machine would you like to see updated? Redos? Remakes? What old machine would you like to see updated? What machine would you like to see NOT remade but redone/reimagined from machines in the past that sucked because it is a) outdated technology b) poorly executed OR c) is a great game that just needs a new version / new vision. Think about all the things that could be done now with the new tech that could not be done back in the day! Don't forget about the EMs... And I"m thinking most SS games fall in this category. A game that is pretty cool but kind of lame to play is the Secret Service which really should have been called Secret Agent. Always loved the music in that game! OK... but what is it about the machines that you like or would want done to improve it? New rules for sure....adding options for timers, jackpots, even a 3-ball multiball, other objectives besides just shooting the tube or spinner. Maybe even some minor changes in the playfield design, although I haven't really thought much about what I'd change vs. rules changes. I just keep coming back to thinking how awesome a new cyclone with multiball,Animation,etc could be for a "non licensed theme".In another thread I mentioned a cyclone pin/carnevil video mashup of some sort.An updated cyclone with a slightly more evil slant from the tokentaker would be sick!If I win the lottery or just finally make enough money to commission the development and manufacture of something along these lines I will! Cyclone would be neat to see as a multiball game. Would love to see a slightly modernized Black Hole. Now with a lower-lower playfield for an even more intense "hole" experience! Time Tunnel, Time Machine with a ball transponder tunnel that zips it to another part of the field. Honestly, none. I'd like to see resources be used on creating brand new games and experiences, preferably games that are unlicensed. It'd be nice to see design teams really take some creative liberties. Pinbot with an LCD screen, some video modes with the planets intergrated and multiball increased to more balls. A brand spanking new Pinbot updated might be nice. Fathom. Selectable between original rules, sound etc and new rules, sound. Always thought catacomb was interesting, maybe a revisit updating the play field in the head. Maybe replace that with a video screen and unlock dungeon video clips on the lower play field. Plus since the original manufacturer is still around......would make rights issues easy, at least for them. Eight Ball Deluxe, best early Bally solid state. Gorgar. Re-ruled to make it a battle between you and GG to save the Damsel(s). Have on-screen power meters and damage inflicted meters. Make the shots in time to BEAT GORGAR and save the girl. Wizard mode is defeating the Skeleton King, who is the real villain of the picture. GG is just a lackey. Do you think there are any EM themes or games that would make a great modern game? 4 Horsemen for sure. But this time it can do without the football players. I'd just like a Ghost Busters with normal flipper gap. What a way to kill a game. Some Bingo games...that would be nice. Or spitting heads like Freddy or Kiss. It would be pretty cool to see someone retheme a No Fear as an Evel Knievel. I could see modes with completing different stunts, plus have some progressive where you make shots to increase the distance of the next stunt. Obviously the longer the jump the more points. Cactus Canyon - Seems like the most obvious choice. I enjoy the theme and layout, but the rules are obviously lacking. If they could redo it and add some depth to the game it would probably be my most wanted machine. Fire! - I just think a theme like that would be cool to see redone. Make your way from Volunteer --> Firefighter --> Lieutenant --> Captain --> Chief by rescuing people and putting out fires. The light show on a game like this could be done pretty well. Shots turn orange as the fire spreads to different areas around the playfield. Multiball could be an add a ball where 2-ball multiball = 2 alarm fire, 3-ball multiball = 3 alarm fire, 4=ball multiball = 4 alarm fire, etc. I just think it's a timeless theme that could be done really well. Plus there are a lot of firefighters out there. Would Big Bang Bar count? Don't care about anything until Monster Bash is announced. Definitely needs a new playfield layout and some minor rules changes. Mario brothers would be sweet..
Orbitor - write deeper rules, maybe an upper/ lower playfield. the curved vacu-formed playfield would put an end to people complaining about dimples in their wood. 'Who Dunnit' updated and re-themed as the Tim Curry movie theme "Clue". 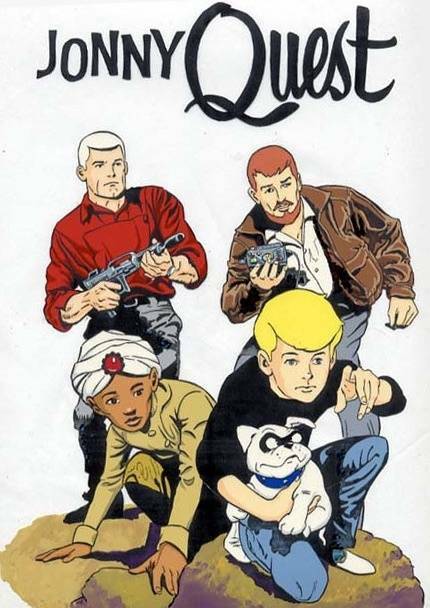 I always wished for the original Lost in Space or.. Jonny Quest... but the market's probably not big enough for JQ.